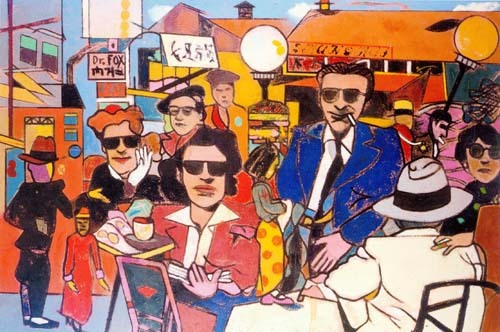 Richard Merkin, painter, raconteur, flâneur, first came to my attention in the pages of GQ magazine where he was the “Style Guy,” a post now occupied by Glenn O’Brien. 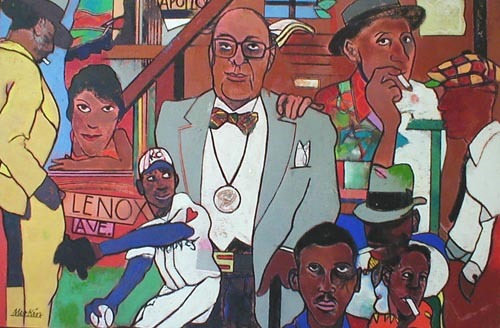 Later I caught a glimpse of him in Alan Flusser’s books. And finally, he was mentioned by a member of The London Lounge who is a friend of his. Who is this enigmatic, incredibly well-dressed man? He is an artist. And he lives his aesthetic. I admire that. In fact, I aspire to it. 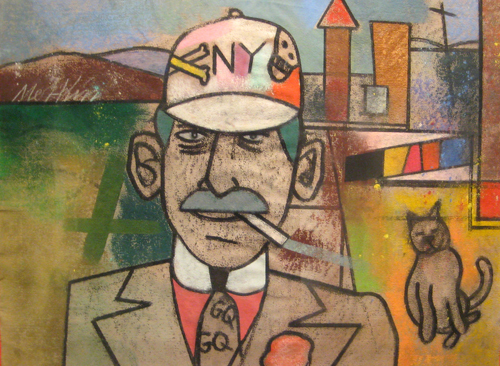 A graduate of and professor at RISD, Merkin has been described as Rhode Island’s “most successful New York artist.” He has also been described by Tom Wolfe. The typical Merkin picture takes legendary American images-from baseball, the movies, fashion, Society, tabloid crime and scandal-and mixes them with his own autobiography, often with dream-style juxtapositions. Well how else should one create one’s own legend? 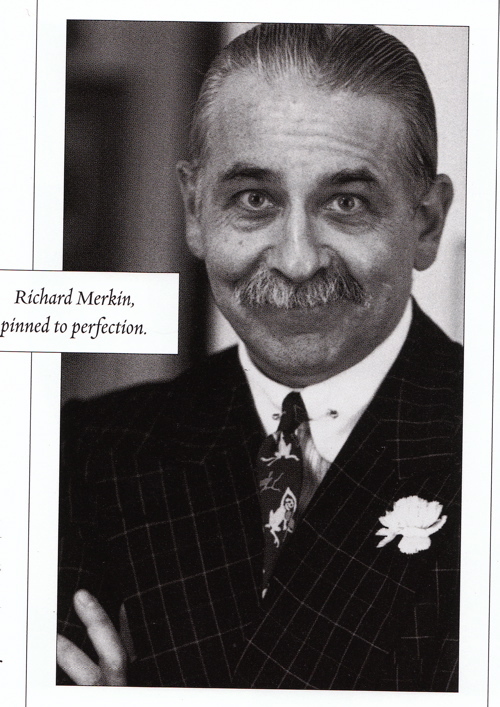 If I had the wherewithal, I would have a Richard Merkin. And a splendid wardrobe to rival his own. Artists can get away with it. So, too, eccentric collectors. Want more? See him on Charlie Rose discussing the Tijuana Bibles and other “outlaw” comics. 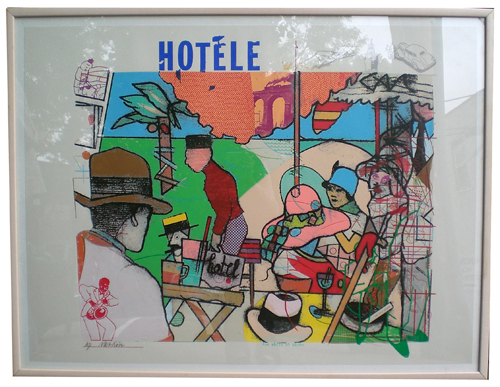 This entry was posted in Elegantology and tagged art, Elegantology. Bookmark the permalink. flâneur = great word. i have a book about walks in paris called flâneur. What a wonderful post! I had never heard of Mr. Merkin before. What a talent. And I love the idea of “outlaw” comics. LuLou, thanks! He’s a piece of work. I think of “outlaw” comics as the evolution of Krazy Kat, and MAD magazine. Just when I thought I knew every flaneur and artist living – you amaze me with your knowledge. A real live cartoon character. Unbelievable… Mrs. E. is just about convinced that we need to train up with the kids to …er… visit the aquarium. If you come up, i will personally give you the book! A very nice offer, dear Fairfax. If we can make it, Mrs. E. and I will only trade the book for a glass or two of bubble on us. 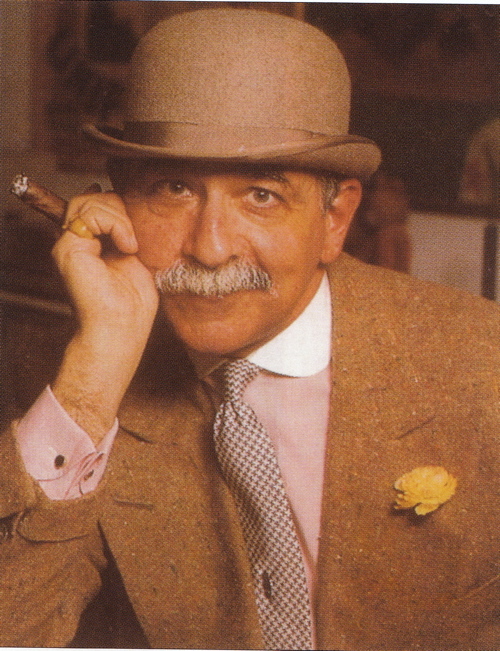 Mrs. PvE, I only remembered him since he was (and is) to my eye remarkably well-dressed…. I didn’t replace Merkin. He’s not replaceable. And our columns are not really related although you could come to the conclusion that neither of us are “fashionistas.” I have been a great admirer of his for many years. And I of you both. Thank you for writing in Mr. O’Brien. Yours is the first page I turn to when my new issue arrives. In fact, I bought a copy of “On Deportment” after you mentioned it was your favourite etiquette book.